Why are people apathetic concerning the return of Christ? Dr. Reagan: Have you ever given any thought as to what kind of explanation will be given by the world after the Rapture happens? When all these people disappear the world surely is going to have some wild explanations as to what happened so as to be able to deceive people. Dennis Pollock: I'm not sure, but I have a feeling they'll at least be smart enough to figure out it was those religious fanatics who have all disappeared, you know, the ones who talked about Jesus and carried their Bibles around and went to Bible studies. They'll be saying, "I always thought something no good was going to come of those faithful folks. Who knows where they are." Nathan Jones: You do know that the New Agers would actually be rejoicing when we're gone, for they're expecting the Rapture as much as we are, but they think that Christians are holding back human evolution and have got to go. Once we're gone they'll think that'll be a good thing that's happened. Maybe they'll explain the Rapture away with UFO's or global warming. Dr. Reagan: True, as a matter of fact in the early 70's books were written by the New Age Movement that said the masters of the universe which are their channeled spirits have revealed to them that a time is coming when they are going to remove from the world all those who live by faith so that those who live by reason can continue in their evolutionary development. I'm sure the New Agers will rush to the microphones and declare, "See, we told you back in 1970's that this would happen." Dr. Reagan: An attitude that seems to dominate the Church today regarding the Lord's return is namely apathy. Why is there so much apathy about the Lord's return when the signs of the times are literally screaming from the heavens that Jesus is about to return? Dennis Pollock: The Bible says, "faith comes by hearing and hearing by the Word of God." So, if you don't have faith, you may wish you had some faith, but you've got to do more than just wish for some faith. You've got to get into the Word and that faith will grow. That faith will come. Attraction to anything comes by exposure. The more you are exposed to something the more you become attracted. For example, we've all had songs we first heard and didn't think too much of them, but when we kept on hearing them the more we began to enjoy them, and they may even have become our favorite songs, and all because we'd been exposed to them. Another example, when I was 19 I decided I was going to enter the world of adults and become a coffee drinker. It just seemed so cool to drink coffee. But, I hated the taste of coffee. I remember being at a friend's house and his dad asked me if I wanted coffee and so all cool I answered, "Yeah, I'd like some coffee." I was thinking I was a big old adult guy now. And so, he gave me this coffee and I took a sip, and instead of being cool my entire goal for that cup of coffee was to drink it without grimacing and making a terrible face! Over time, the more I became exposed to coffee the more I began to like it. And, guess what? Now I can drink a cup of coffee and smile and enjoy it. It goes great with a lot of foods that I enjoy. We can pretty well agree then that as you become more exposed to anything you become more attracted to it, or at least desensitized to it, if it doesn't have any attractiveness to it at all. The same continued exposure to the truth of the news that Jesus Christ will return will attract us more to that fact. If you've never thought about it much, and if it's never preached on, if you never read about it, and if you never watch TV programs that are dedicated to that concept, then of course you have no excitement about the return of Christ. You just never will. It's not enough just to say, "I just don't think much about Jesus' return. I just never have felt much excitement. I guess if the Lord really wants me to get excited He'll just explode it into my heart." No! Get into the Word. Get a red pen and start marking the Scriptures that deal with the return of Christ. Watch programs like Christ in Prophecy. Get a good Bible or Christian books about the return of Christ and read them. Faith and excitement and attraction will then come to you as well. So, that's the primary way to get over the apathy, and that being just to start exposing yourself to this incredible doctrine that saturates the Scriptures — the return of Christ. Nathan Jones: I believe there are two groups of people. The first group of people are the ones who have been waiting for so long that they've lost their excitement and have given up. They are like a friend of mine who a few years back said she was really excited about Bible prophecy when Hal Lindsey came out with Late Great Planet Earth, but then thirty-some or forty years later, the Lord still hasn't come back. All that excitement, where did it go? After all, Paul was talking about the Rapture 2,000 years ago and it still hasn't happened. We know that these past years in God's perspective is a short time, but for us it's been an eternity, and so we can finally just give up. The second group can be found in 2 Peter 3, and they are the one's who think the idea of the Rapture is just absurd. We can find them where it says, "First of all, you must understand that in the last days scoffers will come, scoffing and following their own evil desires. They will say, 'Where is this coming He promised? Ever since our fathers died everything goes on as since the beginning of creation.'" The 2 Peter 3:9 text gives us the response to both of these groups when it says, "The Lord is not slow in keeping His promises as some understand slowness. He is patient with you not wanting anyone to perish but everyone to come into repentance." Jesus is waiting so you and me and all the people who will become saved can be part of the Bride of Christ, which is the Universal Church. Just think that if the Lord came 100 years ago you and me wouldn't even exist, so praise the Lord He is patient and waiting! 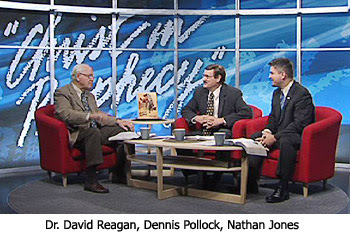 Dr. Reagan: Speaking of waiting, what should we do as we wait for the return of the Lord at the Rapture? Nathan Jones: One of the great things about people who love the Rapture, who understand the Rapture and really get into it, is that they're excited. They're just an excited group of people, and the reason is because it gives them purpose. They understand that they need to be holy. They need to be dedicated to the Lord. For example, when I come into the house sometimes my kids are watching an extra half hour beyond their time limit. They give you this look that kids give you, that guilty kind of look. Similarly, knowing that God could come at any moment, what's He going to find us doing? Knowing that the Lord will come back at any time gives us a sense to live holy lives. Dennis Pollock: If you're an unbeliever, obviously there's only one thing for you to do, and that's to be born again. Receive Christ as your Savior so that you will be prepared, because when Christ comes He's coming for people who are exclusively His. In God's eyes there are only two kinds of people in this world: 1) those who belong to Christ, and 2) those who don't. There is no Partial Rapture which says that if you reach a certain level of holiness then you can be part of the Rapture. Christ is coming for all of His people, and leaving behind all those who are not and subjecting them to His judgment. If you are a parent and you have children, those children are your children. They are different from every other child on the face of the earth. Those happen to be yours, and your blood is in them. Christ looks on a certain people all across this world — black, white, oriental, hispanic — that are His people because the Holy Spirit lives in them. If you are not one of His you need to run to the cross of Jesus and believe in Him and be born again. That's your ultimate preparation. And, if you are a Christian, what you need to do is to abide in Him. John says, "So that when He appears we won't be ashamed before Him at His coming." On my L&L calendar, Feb. 8 says "New Year for Trees" (Tu B'Shvat). I believe that the apathy for the rapture is a direct correlation to an apathy for Jesus and his true message and purpose. People have made Jesus in to who they want him to be NOT who he is-Savior. I did not know about New Agers believing in a 'rapture' to rid the earth of people of faith. They may be disappointed when they see so many 'christians' left here on earth after other christians have actually been Raptured. Wonder what the explaination will be then? @Billy, interesting! I had to look that one up myself and found there're four types of New Years celebrations in Israel. The New Year of the Trees is supposedly like our Arbor Day. Plant a tree! It seems kind of peculiar that on one hand many Christians identify that the Holy Spirit indwelling the Church is what withholds the revealing of the AntiChrist yet at the same time, they will carry the belief that the Rapture is an imminent event, that it can happen at any moment, obviously they contradict themselves! It would seem that under this perception that what is recorded by the Apostle Paul in 2 Thessalonians 2:1-3 in context identifies with the timing of the Rapture! The Apostle Paul identified for the Thessalonian believers that the Rapture would not occur until the falling away (1 Timothy 4:1) which is a clear reference to apostacy and the AntiChrist is revealed! This is but one more proven inconcistency regarding the Doctrine of Imminence. Obviously you can not have it both ways! The AntiChrist will be revealed in his appointed time, as apostacy continues to run its course and lawlessness abounds, the spirit of AntiChrist will increasingly grow in strengty leading to his arrival upon the scene during a time of great upheaval offering peace and prosperity to the globe! We know for a fact that the AntiChrist could not appear until the technology existed for his control over global commerce! In addition we know also that Israel must be back in the land and in control of Jerusalem in order to contruct the Temple and reinstitute the sacrifices which he will halt! This indicates further that the Rapture could not happen prior to this time! In conclusion I will confidently say that the Rapture as all prophetic events has a distinct appointed time and season of fulfillment, therefore the Doctrine of Imminence or any moment theology as it exists is a clear error! Can not wait to see you guys try and wiggle your way out of this one, not being arrogant here, just confident in the truth of the scriptures as they are presented! To be clear, I hold a PreTrib belief regarding the Rapture or Blessed Hope yet I also believe the initial revealing of the AntiChrist as he steps on the scene in the aftermath of the Gog/Magog battle and the ensuing global economic collapse that will accompany it, does not take away from this view! Nobody knows when God the Holy Spirit is going to stand aside. He could have stood aside when the Apostles were still alive; retaining imminence. No contradiction here whatsoever if you read plainly without trying to twist into a personal agenda. Rodeny: The Apostle Paul identified for the Thessalonian believers that the Rapture would not occur until the falling away (1 Timothy 4:1) which is a clear reference to apostacy and the AntiChrist is revealed! This is but one more proven inconcistency regarding the Doctrine of Imminence. Obviously you can not have it both ways! Apostasia means ‘departure’, literally a ‘leaving’. Elsewhere it is used to describe the leaving of a place. As the early church was already in dreadful apostasy with Gnosticism in full flow, common sense says it has to mean departure other than ‘from the faith’ This is obviously the standing aside of the Holy Spirit as the church departs with Jesus. At some unknown time after the imminent Rapture, the a/c will be revealed at an unknown time appointed by God. There could be a considerable gap before the a/c is revealed; we have no details about that. No prophecy HAS to happen before the departure of the Church, which includes the building of the Temple. This does not affect the imminent Rapture. There are no inconsistencies reading the grammatical plain sense meaning. Hello Rodney: I had ‘retired’ myself from blogging; but I am too fired up with righteous indignation (not anger) of the manipulated, mishandling and wrongly dividing of Scripture that I couldn’t let it pass in the hope that you will eventually come to see that your personal interpretations totter on an unstable foundation - God bless you and your family. The doctrine of imminence is based on the simple, grammatical fact that the Apostles used personal pronouns along with the present tense, to include themselves being alive at the rapture with no prophecy to look for. Without the literary evidence, imminency would not exist and neither would there be any evidence for Pre-trib. Pre-trib is imminence and imminence is Pre-trib. They are one and the same, they exist one because of the other and bears no relationship to any prophecy whatsoever, including the Gog/Magog battle however you interpret it. Regarding the technology. To mark the body with a tattoo is as old as man. You are making assumptions based on what you see today. The early church believed in an imminent rapture without any knowledge of futuristic technology. The Romans already controlled commerce and forced worship of another deity is also as old as man himself. The NEEDING of the TV to see the two witnesses dead on the streets of Jerusalem, WE today can see how that may happen via satellite. That doesn’t mean that is how it will actually happen. If God says the whole world will ‘see’; that’s what He can arrange WITHOUT any help from modern technology. He was just as capable to fulfil prophecy 2000 years ago, just as He always has. Don’t put limits on how God achieves His plans. I am too old for an effective wiggle, thankfully a wiggle wasn’t required. Indeed you are all my online friends and bros who I look forward to meeting ANY MINUTE NOW! :) Just now, I am a bit cast down, over laden, generally pooped and past it! The following events could hapeen within the next 12 months...yes or no? You say you are Pre-Trib. Since the Treaty triggers the Tribulation period countdown, then you MUST believe the Rapture occurs before the Treaty. Based on your answer I may have a follow up question. Btw, you took the edge off your last posts and it was a pleasant experience to read them when compared to previous ones. Thank you. If you don't agree with the following events above...how WOULD YOU put them in order and what would be your time frame? Billy, I agree with the chronological order as presented in your second set with one particular variance. I do not believe the covenant established with many, directly includes Israel, I believe this to be a global disarmament treaty to usher in a time of false peace! E.I., sorry, but your rebuttal was not at all convincing! As I have shown in previous posts, Maranatha has nothing to do with the Rapture but was a call for divine justice recognized in the establishment of the Kingdom by the return of the King! This too, is a clear error of grammar with little research however, the truth concerning this usage is visble! God Bless you and your family also! Thanks. Don't have a follow up comment except I'm liking the "new" Rodney in these posts! This type of challenging response from you "Can not wait to see you guys try and wiggle your way out of this one, not being arrogant here, just confident in the truth of the scriptures as they are presented!" is not what I would consider offensive and there was no personal attack. I hadn't "seen" you around...didn't know you'd "retired" from here. I was worried. Glad to know you are still around. Hope you pop in occasionally. If you do "retire" from here and we throw you a party, be sure to have the chicken or macaroni cheese, but definitely not the steak pie. Billy, just so you understand, I have a balanced approach and when provoked I will supply the exact measure I am provided with! Even the Lord did not sit idly by as he was being brought accusations by the Pharisee's! I do my best to provide a measured response! If that offends your sensibilities perhaps it is best if you not read my responses to those that compass me all around! I can be patient and I can be kind, I can even love my enemies, however I can also address those who falsely accuse me, that is also my right specifically those who claim to be my brothers and sisters in Christ! The Apostle Paul had to defend himself even against fellow Apostles who sought to accuse him of prefering fellowship with pagans rather then his own brethren! I expect to pop in from time to time and it will not be very long before I see you and everyone face to face with Jesus. PS. Please take note that Rodneys odd ideas come from his allegorising the text aka C.T. which I keep forgetting, thinking I can reason with him - hence the confusion his interpreations emit, and the very familiar aggressive behaviour it always invokes. If someone falsely accuses you (which is different than mere disagreement) then they have broken a commandment of God, Who says vengenice is MINE (God's), not yours, Rodney. God deals with sin. Not you. You deal with sinners. And since you are a sinner and just as deserving of the fires of hell as the rest of us maybe the way you should get off your high horse and deal with a fellow sinner by doing what Jesus said to do...forgive them. Aaaaaaand, that's enough of this thread. Let's not encourage any more of Rodney's chest thumping and let us just stick to Bible prophecy. Thanks! My conscience has been bothering me and I have been hoping someone would point out my error. So sorry, as t his statementis wrong, it is a stance I adopted when parleying with Posties who insist the 7 years is not God’s wrath but mans and Satan’s. These claim that God’s wrath is poured out AFTER the Tribulation seeing only one set of cosmic signs as God’s wrath at the end! Getting nowhere giving evidence that every bit of the 7 years is God’s wrath, intensifying, I became used to side-stepping the fact that the Church is not destined for wrath ( of any kind) which by itself reveals that the Rapture is obviously Pretrib, and went straight for imminence in the grammar to save time and energy. The Seal judgments in Rev.6 consist of God’s four sore judgments which He has always used as judgment. Lev 26:14-46 sword,pestilence, famine, wild beasts. Ezek14:21 For thus saith the Lord GOD; How much more when I send my four sore judgments upon Jerusalem, the sword, and the famine, and the noisome beast, and the pestilence, to cut off from it man and beast? ...so back on track...I will say I am solidly on the side of the Rapture is imminent and no events are required for it to occur. That topic is now off my radar. Please don't think I am being contradictory, it’s just that I see another side to this. In conjunction with the purchase of the much maligned ‘Living Bible’ with being forced to check the Bible by a challenge by some JW’s, it was then that I really began to grow in The Faith. When I was younger, I would get so passionate to be sure of the truth, and equally so to square up to any who went against it. I was once called ‘intense’, and I was so insulted; but it was true, error fires me up in my spirit where previously I was barely a ‘smouldering flax’. Error, or opposition, acts like the breath of The Holy Spirit to oxygenate, rather than quench my ‘embers’. Yes it is irritating and troublesome, but that acts like a burr under me saddle that I would buck to get rid of. I have to admit that I am a nightmare to handle, and one Pastor would say ‘uh oh, here comes trouble’ with a nervous smile. Most avoid me like the plague. Can’t blame them, I don’t blame them, because no one likes to be closely questioned or challenged, right or wrong. That’s how I see old Rodders, a tool in the hand of The Holy Spirit to make me be sure of His Truth and acquire a ‘ready answer’ (from all angles).